This is a guest post by Karen of Living Low Carb… One Day at a Time. Like me, Karen is following a grain free diet to heal her body (I’m telling you, grain-free is the way to go!). 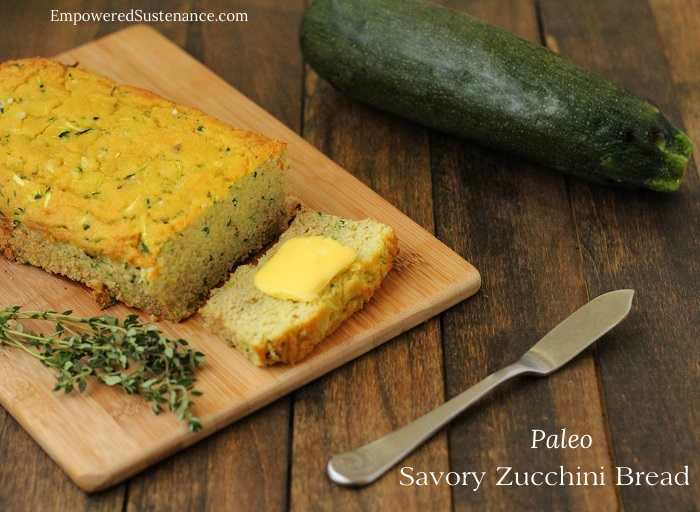 I know you’ll enjoy this recipe for Savory Coconut Flour Zucchini Bread along with the other myriad of recipes on her site. 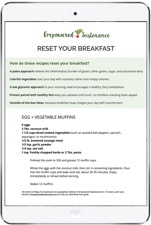 Also, her ebook Awaken: 30+ Egg-Free and Grain-Free Breakfasts answers the conundrum of eggless, grain free breakfasts! Because my diet doesn’t include grains I often get asked if I miss regular bread. For me eating grain-free is helping to heal my digestive issues and for that alone it would be totally worth it to miss out on bread. The good news about being grain-free is that with recipes like this Coconut Flour Zucchini Bread you don’t have to feel like you’re missing out. This bread is also a great way to use up leftover zucchini from your garden. 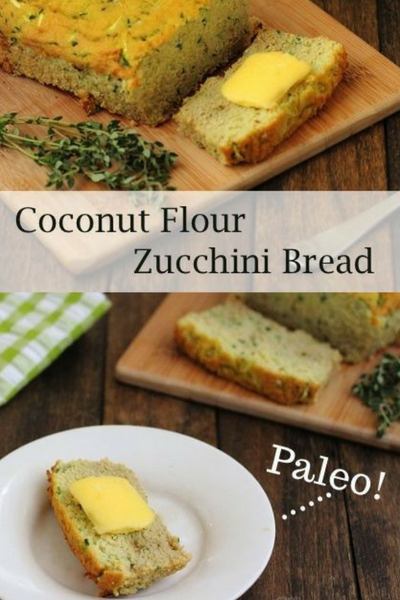 Since coconut flour baked goods are known for being on the dry side the zucchini helps add moisture to the bread. This Savory Coconut Flour Zucchini Bread makes a great addition to the dinner table. I ended up topping my bread with ghee, but it would also be great with a little bit of homemade marinara sauce on top. The flavor combination goes great with Italian style dishes or maybe you can try your hand at making a savory French toast. Mix the eggs, butter or coconut oil, apple cider vinegar, and zucchini. In a separate bowl, mix the coconut flour, sea salt, thyme, garlic powder, and baking soda. Pour into a greased loaf pan that has been lined with parchment paper and sprinkle the top with sea salt. Bake at 350 degrees for 50-60 minutes or until cooked through.Allow to cool completely before serving. You can also make these into Coconut Flour Zucchini Muffins. Pour into a muffin tin lined with paper liners and reduce baking time to about 25 minutes. Karen stared her health journey back in January 2011 when she finally decided to make a lifestyle change and get healthy. 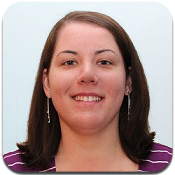 She started her blog in December of 2011 as a way to hold herself accountable for losing weight and keeping it off. After about a year, she felt there was more she needed to do to truly heal her body. She ended up cutting out grains in an effort to heal her digestive issues since the gut plays a powerful role in overall health. Karen is also the author of Awaken: 30+ Egg-Free and Grain-Free Breakfasts which features delicious breakfast inspiration for those that do not tolerate eggs or are looking for something different. Changing her diet and lifestyle has helped her discover a passion for cooking and sharing delicious recipes with others on the same kind of journey. Stop by and visit her blog http://lowcarboneday.com or on Facebook, Twitter, or Pinterest. Well, I am a little late to the game but yes you can use the squash. I’ve made squash bread a dozen times or more, and everyone loves it just as well. I usually made a more traditional sweet bread but it subsituted out just fine so I am sure it would in this too. Of course, yellow squash can always be substituted for zucchini, they are basically the same thing. Can this bread be frozen? No, egg replacers will not work here. The coconut flour requires real eggs as a binder. I was SO Excited to make This Recipe and I made sure to get enough zucchini to make My Pasta Sauce AND THIS… However, There’s A Glitch [There’s ALWAYS A Glitch! ]~ I forget The Apple Cider Vinegar! Grrrr~ Sooo, what happens if I leave THAT out? I’m confident that The World As We Know It WILL Continue On… No spinning out of control on its axis… Right?? YEEES! I May go ahead and try it tonight, but Most Likely I WON’T. Thanks So Much~ For Your Assistance, AND FOR ALL OF THESE INCREDIBLY FABULOUS RECIPES! Oh Yeah~ It Just dawned on me that You’d mentioned having This Bread With Marinara Sauce… And THAT’S Pretty Much WHAT I Made (I’m actually not real clear what makes a Tomato Based Sauce~ with veggies [& This Time some mediocre chicken sausage]~ One Thing Or Another… My bff would tell me to “Google IT”!) AND I KNOW IT Would Be Delicious With IT! Oh My Heavens~ I Just saw My Comment/Question And IT’S SO LONG… YIKES! I apologize for blabbing so much~ I DO have a knack for Making A Short Story Long! Hi Kat! I appreciate your comment and it’s not too long. I’m glad you enjoyed the recipe! I just finished making this recipe. It is very sponge-y and taste egg-y. Did I do something wrong? Perhaps, If I store it in the fridge first, it might cancel out the egg-y taste. What do you think? YOU did nothing wrong. That’s one of the side effects of cooking with coconut flour. What I do is, in this particular case, add some extra herbs, which I like anyway, and it helps to “under~power” the Egg Taste. The other issue of baking with coconut flour is, like you mentioned, the consistency… I learned an effective trick from DIVALICIOUS which is (www.divaliciousrecipes.com~ She’s a fabby blogger who focuses on ALL Low/No Carb & SOME Vegan Recipes. Like Me, she Loves Cream Cheese & you’ll see quite a number of recipes that use it.😍) to SEPARATE THE EGGS, ADD THE YOLKS AS INSTRUCTED IN THE RECIPE. THEN BEAT THE WHITES UNTIL THEY’RE STIFF AND FOLD THEM IN AT THE VERY END. I believe I did notice quite a difference and This Technique gave it a More Bread~y Consistency! I Trust This Helped. I’m going to make THIS FABBY BREAD RIGHT NOW (& unlike last time I have ACV!) And WILL Use That Technique, too! I also add some onion to this recipe to Pump Up The Flavor~ I love onions. HAPPY HOLIDAYS TO ALL! Hmm, I think This Bread Would Be PURRFECT For A Thanksgiving Feast. Kay, it sounds like you are frustrated there are no nutritional facts for this recipe and you are requesting nutritional info. While I don’t provide that on my site, there are many nutrition calculators available for free online, where you plug in the ingredients and get the nutrition info per serving. What is the best way to store this cooked bread. I’ll probably eat it before needing to freeze it but am wondering if it would be okay on the kitchen counter for a couple days… thank you!